I haven’t felt as inspired by drawing interiors as the other sections I have completed. I think it’s partly laziness as interiors seem to demand a lot more focus and making more choices than still life. I took ideas from the sketches I’ve done around the house to inform the final piece. I worked in pastel because I have liked the slightly odd, fuzzy and dreamlike quality it gave to previous sketches. The paper was a sheet I already had and had a texture which affected how the pastel went on. 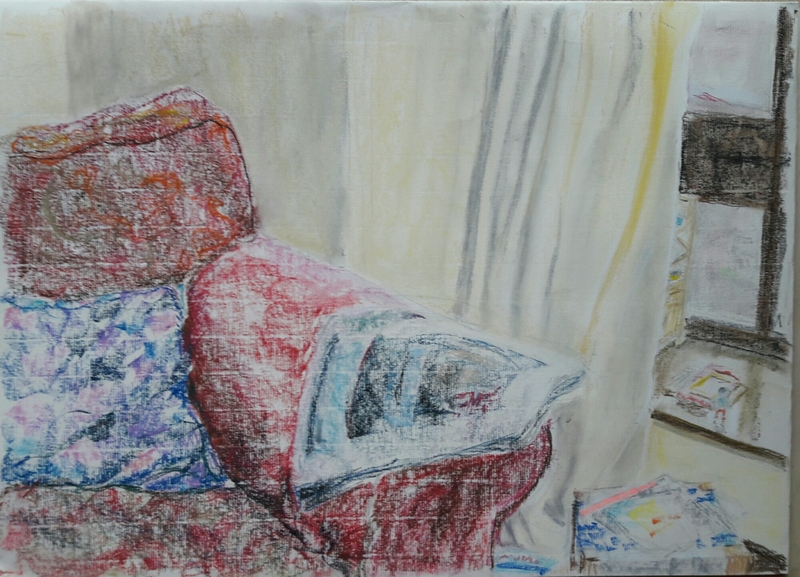 I took advantage of this by leaving the texture exposed on the chair which had a slightly rough fabric while rubbing in the pastel on the smoother areas such as the walls and curtains. I wanted the picture to look like someone had just left. The person from the chair who left behind a squashed cushion and the newspaper, and the child who had been playing with a toy on the window sill. Generally I am pleased with how this picture has turned out. I did debate whether to collage an actual newspaper then draw over it but couldn’t get it to look effective – I decided it was something I needed to explore in my sketchbook. I am slightly concerned that I am not being experimental enough with my media so this is something I’m going to look at in my sketchbook. Additional note: I have just come across a discussion on the Drawing 1 email list (an email to this list goes to everyone on the course). A discussion sprang up about what is a drawing and what is a painting. A pastel can be a painting if it doesn’t contain the mark-making inherent in a drawing. Work with paint can be a drawing if it does contain mark-making So, is my work above a drawing or a painting?